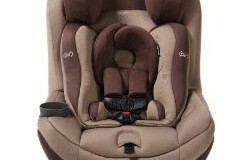 Graco SmartSeat All-in-One maybe the solution to finding the best car seat for your child. They have designed a superb car seat that will not only hold your baby as you drive along, but will also protect your baby in case of a road accident while still giving your baby a comfortable ride in your car. This smart car seat offers both a rear facing recline mode as recommended by the American Academy of Pediatrics if you have a child under 4 feet 9 inches tall, and it also offers a forward facing mode to put your child in when the grow too big to be in the rear facing mode. A rear facing mode that can holds a baby’s weight of between 5 to 40 pounds and also a forward facing mode that could hold a baby of 20 to 65 pounds to help accommodate a child when he/she grows to big to fit In the rear facing mode. All car seats comes with a stay in base that you can leave in your car all with a belt lock to ease you from the stress of constantly reinstalling the base every time you have to travel with your baby. 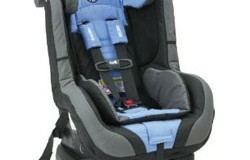 The base of the seat is steel reinforced and so is the car seat’s frame to protect your baby from any harm. This also safeguards the durability of the car seat as you wouldn’t have to replace it in the eventuality of a road accident. Both the seat and the stay in base have lock indicators to detect if the seat is properly locked and installed in the car. The seat’s back rest is lined with expanded polystyrene foam (EPS) to cushion the baby when he/she is in the car thus giving it a smooth riding experience. The seat also comes with a cup holder to keep your baby’s drink close to him/her. The car seat level indicators are easy to read thus eliminating the chances of guessing which level is best and safest for your baby. 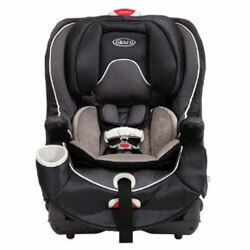 The car seat offers different recline options, up to 5 different positions once you have installed in the stay in base. 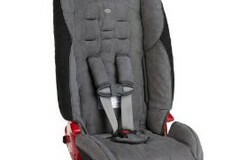 You can adjust the seat’s sell to any position you might want your baby in thus eliminating the option of using towels that may move and change the recline position of your baby when you are driving, endangering your baby in the process. The steel reinforced car base and seat will definitely protect your baby in the eventuality of an accident as the car seat has been put under a crash tests to see what will happen to it during an accident. The results of the crash tests proved that the baby will be safe if the car he was in had an accident. The EPS foam lining on the seat will definitely give your baby a smooth ride especially if you are driving in rough terrain. The Graco smart seat is definitely one of the best car seats in the market if not the best as it is not only easy to install, but it will also give your baby a comfortable and safe ride. Its definitely the best $300 you would have spent on your baby that will serve you for a long time if you are planning to have more babies. Summary : Another excellent product for Graco.